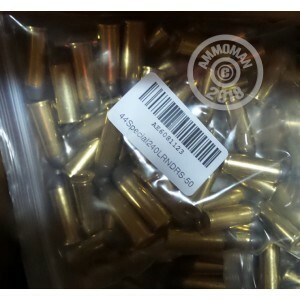 These affordable rounds are great for practice with your .44 Special. The bullets possess a weight of 240 grains which is standard for the caliber and will also make an excellent light recoiling training round for your .44 Magnum. Lead round nose (LRN) bullets have no jacket and the soft exposed lead will expand on impact with the target. While this mushrooming effect isn't as drastic as a hollow point round, it still finds use by many shooters as good ammo for taking small game with lever-action carbines or self-defense duty in the nightstand. The flat point of the bullet is a blunt tip which not only assists the aforementioned expansion but also leaves nice clean holes in cardboard and paper targets. That expands these rounds' versatility at matches and training sessions. These rounds are assembled with reloadable brass casings and Boxer primers.